Where the old warehouses, high-tech lofts, and chic eateries of San Francisco’s Potrero Hill rub up against the gritty streets, ecstatic murals, and colorful Latino and hipster cultures of the Mission District, a burgeoning art scene is coalescing. (Notably, the Mission is also namesake to one of the city’s most recent art movements: the graffiti-/street art-driven Mission School.) Featuring both commercial galleries and new alternative spaces, this emerging arts nexus promises to bring greater visibility to the rich network of San Francisco’s more experimental visual arts talent, as well as to draw in national and international artists and projects. The Mission/Potrero scene started to simmer visibly in 2006. That year, Eleanor Harwood–who’d been involved in the Bay Area art scene through her work curating the Adobe Books Backroom Gallery–opened her eponymous gallery at Alabama and 25th Streets. Just a few blocks away on 24th Street, Dina Pugh and Joyce Grimm took over operations at Triple Base Gallery, turning it from an organically organized artist space into a community-engaging commercial gallery. Both venues have focused on supporting emerging, often local, artists, many of whom now have strong art careers. 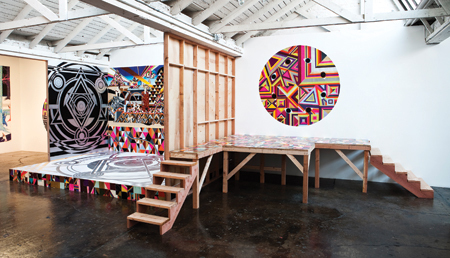 (Zoe Crosher, who shows with Hardwood, was invited this fall to participate in the 2010 California Biennial). Also, just down from Triple Base is the forty-year-old Galeria de la Raza, a nonprofit art space focused on supporting Chicano/Latino visual, literary, and media artists. Within just over the last year, these outliers from the San Francisco’s more established downtown scene got a lot more company. 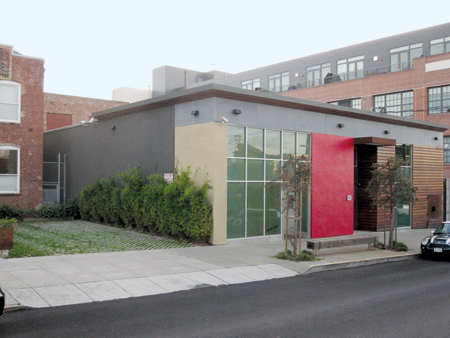 In October 2009, the thirty-six-year-old highly respected and progressive artist-run nonprofit Southern Exposure settled into its new home, a large, open, brick building, on 20th Street. It was followed in the spring of 2010 by Guerrero Gallery and then Gallery Hijinks, both just blocks away. Steven Wolf Fine Arts, which opened in September 2010 across the street from Guerrero, is the most recent addition to the neighborhood. They are all only a short jaunt from the earlier established trio (and all fairly accessible via the city’s BART train). To further enhance the situation, come early March, a trio of art entities will make their home in a space at 20th and Folsom. It will house the object-based art publication The Thing, the People’s Gallery, and Kadist SF. The Thing is moving from a studio to a more public space. Co-creator Jonn Herschend, who runs the project with Will Rogan, notes that, while this new location will primarily serve as the publication’s office space, it will also be open to the public, and events will be hosted there. The People’s Gallery is an associate project of the Independent Curators International–supported People’s Biennial, a two-year traveling exhibition curated by Jens Hoffmann–who is also director of the CCA Wattis Institute for Contemporary Arts–and artist Harrell Fletcher. The focus of the gallery and biennial is on giving exposure to outsider or underexposed artists from across the country. The People’s Gallery will feature bi-monthly solo exhibitions of work by artists featured in the biennial. And then there’s the multifaceted Kadist, a nonprofit that originated in Paris. This space–run by independent curator and art journalist Joseph del Pesco and Devon Bella, a curator at Adobe Books backroom gallery and curatorial assistant for the 01SJ Biennial–will establish Kadist’s San Francisco presence. This local incarnation will feature a residency for curators, artists, and art publications; art collections, such as its “101 Collection,” a group of contemporary works created by artists who live within close proximity to the West Coast’s Highway 101; and twice-weekly presentations, on Wednesdays and Saturdays. The Wednesday offerings will include screenings, readings, performances, and the like. On Saturdays, the space will be an art magazine reading room stocked with English-language publications from all over the world. To kick off its establishment, this 20th and Folsom crew plans to host an event on March 9, 2011; details are pending. Meanwhile, the Mission/Potrero art spaces are also coordinating an event for March featuring one-night-only happenings in each location, marking an auspicious beginning for a uniquely inventive–and truly San Francisco–art scene.